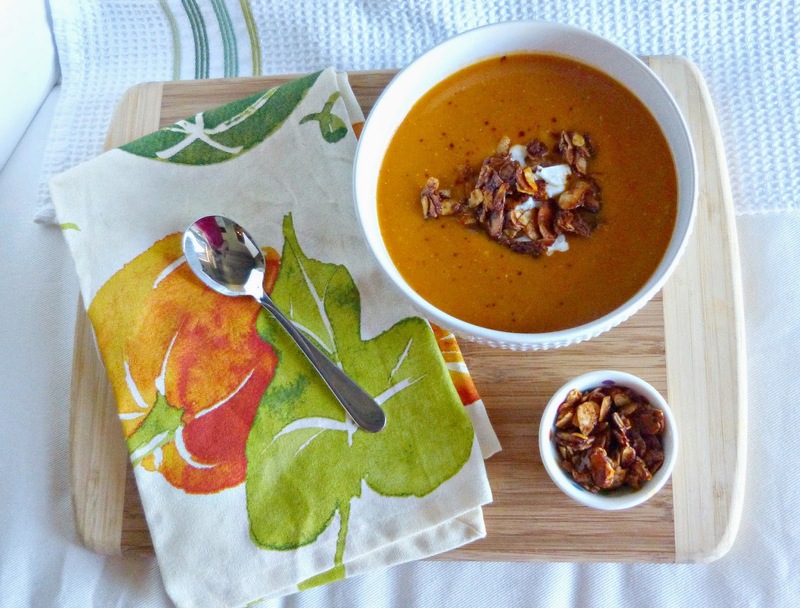 Butternut squash soup is one of my favorite foods to make and enjoy during the chilly fall season. This spicy, smoky, and sweet version is a great variation on this comforting soup. Leaving the office for the past few weeks, I have passed a little cafe on my way to train with a chalkboard outside advertising its fall specials. 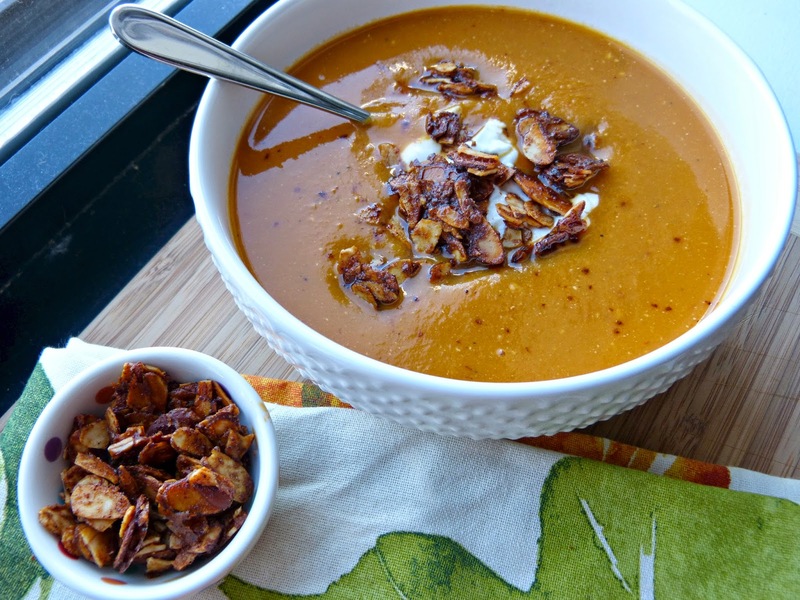 Their chipotle pumpkin soup caught my attention more than once and so I made a note to try coming up with my own version at home-- and this one is a winner! This soup is simple, but with some real depth of flavor. Butternut squash itself is rich and sweet and when roasted and pureed, those flavors only become more intensified. 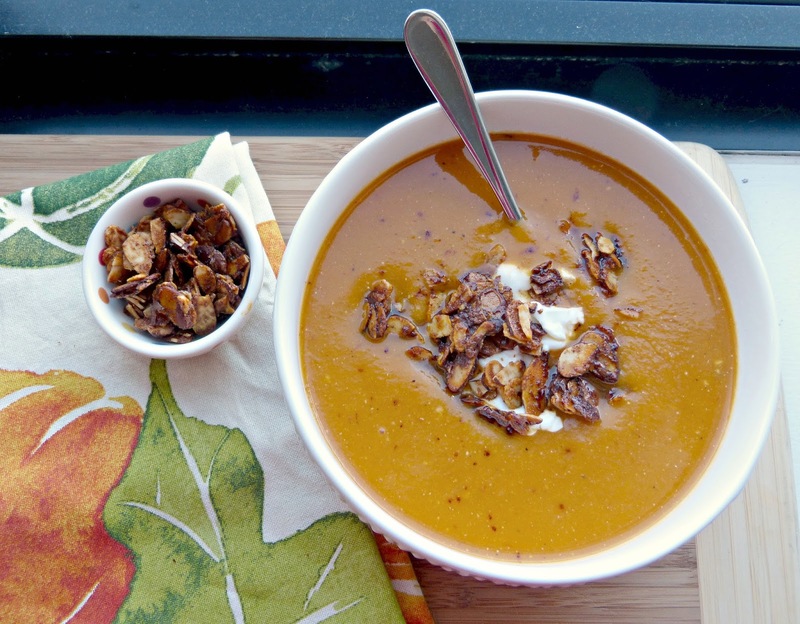 The soup is simmered along with savory onions, sweet fall apples, and smoky chipotles in adobo and then pureed to create a thick bisque-like soup. The chipotles add a really unexpected kick of heat to this typically sweet soup-- and you can adjust the level of heat here to your liking. A little can of chipotles goes a long way! Typically with a thick and creamy soup like this, I like to finish it with something a little crunchy. Croutons are great; so are crackers, pepitas, or even tortilla strips. For this sweet and spicy soup though, I made some delicious glazed almond slices that are both sweet and spicy and that add some much needed texture to this silky soup. Along with a dollop of plain Greek yogurt (or sour cream), these nuts are the perfect topping for this soup. That recipe is coming your way tomorrow! Cut the top and bottom off of the butternut squashes and use a sharp knife to carefully peel off the skin. Cut each squash in half lengthwise and use a spoon to scoop out the seeds inside. Discard seeds and membranes. Cut the squash into 1-inch chunks. In a large bowl, combine diced squash with 2 Tbs. olive oil and season with salt and pepper. Toss until well coated and then spread out on a large baking sheet. Roast for 25-30 minutes until squash begins to caramelize and is fork tender. Meanwhile, heat remaining 1 Tbs. of olive oil in a large Dutch oven or stockpot over medium heat. Add onion and saute for 5 minutes, until onion begins to soften and become translucent. Add garlic and saute for an additional 2 minutes, stirring often. Add apples to the pan and saute until apples begin to soften, about 6-8 minutes. Pour in white wine and bring mixture to a boil. Reduce heat and simmer for 10 minutes, stirring frequently and scraping any browned bits from the bottom of the pot. Add roasted squash, chipotles in adobo (peppers and liquid), broth, water, and nutmeg to the pot. Bring mixture to a boil, reduce, and simmer for 20 minutes. **Note on chipotles: There are about 7 Tablespoons in one 3.5-oz. can of chipotles in adobo. A full can makes this soup REALLY spicy (like Hot on the Mild, Medium, Hot salsa scale), so base the amount you use here on how spicy you like your food. 3 Tbs. will give the soup some nice mild heat, whereas the whole can will make your soup very spicy. Allow the soup to cool slightly and then puree. I prefer to use an immersion blender, which is convenient because you can blend the soup right in the pot. Just be sure to stir in between blending to find any lumps that you missed. The second option is to ladle the soup into a blender to puree. If using this method, it is usually wiser to let it cool a little longer before pouring it into the blender. If you used a blender, return the pureed mixture to the pot. Heat the mixture over low heat and stir in the Greek yogurt and salt and pepper, to taste. Serve warm with garnishes of your choice: Additional Greek yogurt, sour cream, shredded cheese, toasted pepitas, or glazed sweet & spicy almonds. Bannerizer made it easy for you to promote ClickBank products by banners, simply go to Bannerizer, and get the banner codes for your favorite ClickBank products or use the Universal ClickBank Banner Rotator Tool to promote all of the ClickBank products.